Pelenna Patchworks: Pelenna Patchworks January quilting tools & fabric sale! Pelenna Patchworks January quilting tools & fabric sale! 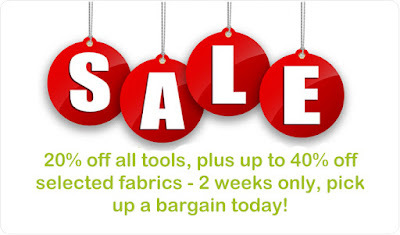 Our January sale is launched today - with 20% off all quilting tools, bag making supplies, knitting and crochet accessories, plus up to 40% off nearly 150 different fabrics, make sure you get in early to get a great deal - once the fabrics are gone, they're gone!